New FastCGI request handler is created for every request from Nginx, than request looks for corresponding web application by HTTP_HOST server variable and after application have found creates new HttpWorkerRequest inside of it, and calls Process method to process it. While processing web application communicates with FastCGI request handler (asks for HTTP headers, returns HTTP response and so on). Because FastCGI request handler and web application are located in different domains all calls between them goes through remoting. Remoting calls binary serialization for objects are passed and this makes application slow. I'd rather say remoting makes application VERY VERY VERY SLOW if you pass complex types between endpoints. It's a prime evil of distributed applications which need to be performant. Don't use remoting if you have another choice to communicate between your apps. OK, we found, that fastcgi server actively uses remoting inside of it and this can reduce performance. But is the remoting only one thing which dramatically reduces the performance? Maybe FastCGI protocol itself is a very slow and we couldn't use fast and reliable mono web server with nginx? To check this I decided to write simple application based on mono-server-fastcgi source code. The application should instantly return "Hello, world!" http response for every http request without using remoting. If I could write such app and it would be more performant, I would proved that more reliable web server could be created. 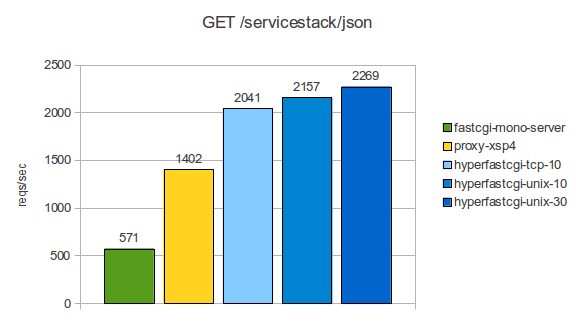 Before publishing results, let's remember benchmarks of mono-server-fastcgi were maden in previous post. Significant difference isn't it? These results give us a hope, that we can increase throughoutput of fastcgi server if we change the architecture and remove remoting communication from it. By the way there is a room to increase performance. Are you ready to go further? It gained up to 5-10%. Not so bad but I want to increase performance more better, because when we'll change simple http response from fastcgi request handler to real ASP.NET process method we will loose a lot of performance points. 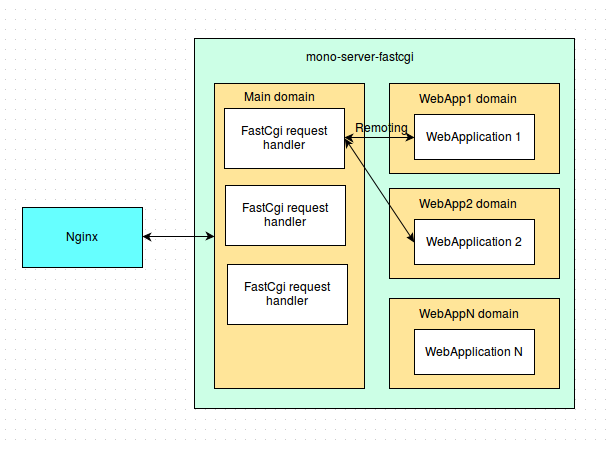 One of the questions, answer to it could help to increase performance: is there a way to keep connection between nginx and fastcgi server instead of create it for every request? In above configurations nginx requires to close connection from fastcgi server to approve end of processing request. By the way FastCGI protocol has EndRequest command and keeping connection and using EndRequest command instead of closing connection could save huge amount of time in processing small requests. Fortunately, nginx has support of such feature, it's called keepalive. I enabled keepalive and set minimal number of open connections to 32 between nginx and my server. I choosen this number, because it was higher than the maximum number of concurrent requests I did with ab. The target is clear now. I am going to create fast and reliable fastcgi server for mono, which can serve in second as much requests as possible and be stable. Unfortunatly it cannot be maden as just performance tweaking of current mono fastcgi server. The architecture needs to be changed to avoid cross-domain calls while processing requests. I wrote my own connection handling using async sockets. It should also decrease processor usage, but I did not compare servers by this parameter. I totally rewrote FastCGI packets parsing, trying to decrease number of operations needed to handle them. I changed the architecture by moving FastCGI packet handling to the same domain, where web application is located. Currently there are no known memory leaks when processing requests. The performance compared to original mono fastcgi server raised up serveral times! But this is not enough. While testing I found that threads created and destroyed very often. Creation of threads is expensive operation and I decided to increase minimal number of threads in threadpool. I added new option /minthreads to the server and set it to /minthreads=20,8 which means that there will be at least 20 running working threads in threadpool and 8 IO threads (for async sockets communications). Such easy thing gives performance boost up to 20%! I'd be very interested in seeing more development on this. Have you seen evhttp-sharp? It's a wrapper around evhttp from libevent which someone wrote for C#. It performs extremely well (see nancy-libevent and evhttp-sharp in this benchmark: http://www.techempower.com/benchmarks/#section=data-r8&hw=i7&test=json&s=2&l=2 ). I would be curious to see how your implementation compares. This is a great study, very thoughtful. 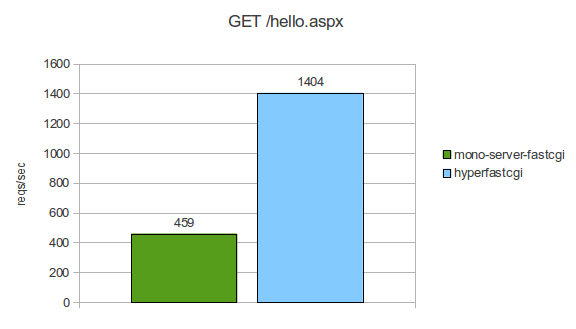 At the end, you determine that serving hello.aspx is fastest with XSP4 alone. Would you still recommend using that over nginx? I would not recommend to use XSP4 for hosting web forms applications which can handle large amount or requests. It does not designed to handle AppDomain unload event, which can occur during web-server working cycle. More info about it you can read here http://forcedtoadmin.blogspot.ru/2013/12/unexpected-unloading-of-mono-web.html. In few words: if you have not precompile your .aspx files your server goes down after serving 160K-170K requests, and absence of precompiled pages is not the only reason which can raise this event. By the way, you can use HyperFastCgi server (http://github.com/xplicit/HyperFastCgi) to serve your web-forms application. It handles properly AppDomain unload event (I've tested it with 10 millions requests to *.aspx page and there was not denial of service, nor memory leaks). Also, nginx + HyperFastCgi has better performace than nginx with proxy to xsp4 and just little less than xsp4 standalone. Very many thanks for that explanation. I've read a great deal on XSP versus Apache versus Nginx. Many say "Don't use XSP in production" but never explain _why_, and that's important to me - HyperFastCgi here I come! I really appreciate your in-depth study of mono on linux - I love the fact that I can develop on my Mac and deploy my C# applications on Linux. A first class blog, thanks again.